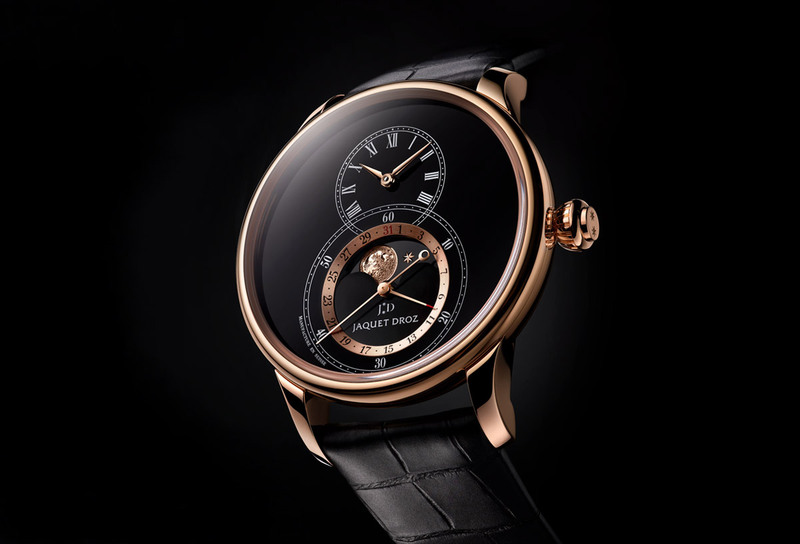 In 2017, Jaquet Droz integrated a moon phase complication into one of its most emblematic models, the Grande Seconde. In doing it, one of the main challenges for the watchmakers of the brand was preserving the key elements of the dial and, in particular, the purity of the two interlaced dials which form a figure eight, the symbol of completion and plenitude. The integration was perfectly executed and three model versions were initially presented: in steel with silvery opaline dial, in steel with black onyx dial, and in red-gold with ivory enamel dial. 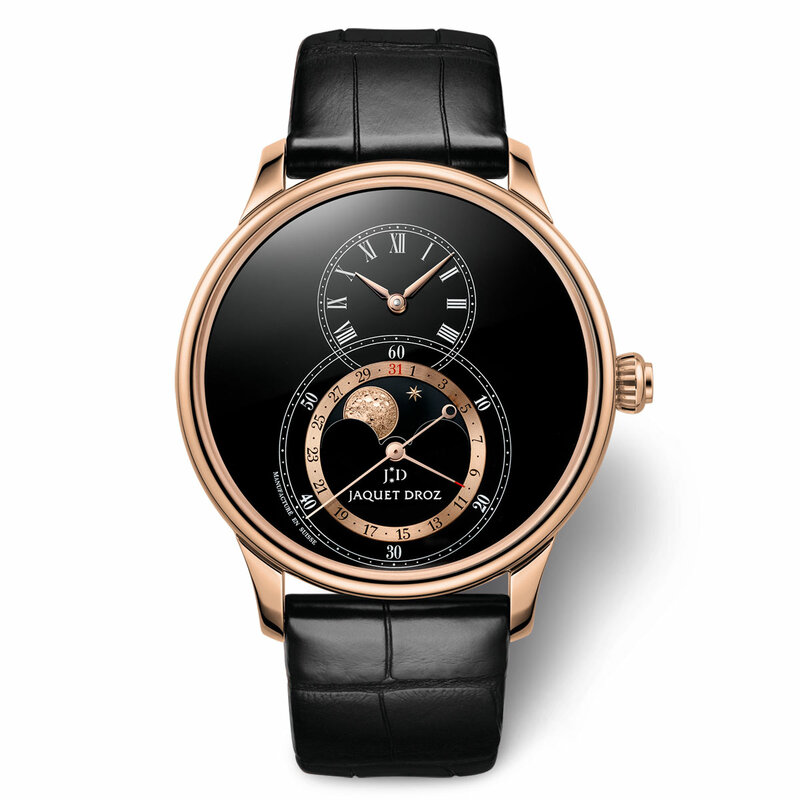 This year, a fourth exclusive variation will debut at the upcoming Baselworld show (March 22-27): the Grande Seconde Moon Black Enamel. 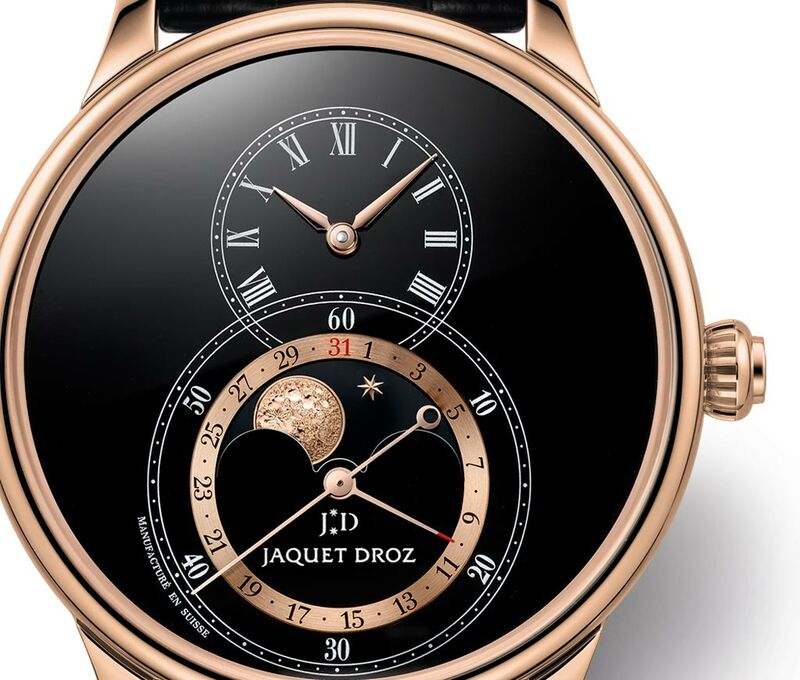 As the name in part suggests, this model is characterized by a fascinating double-level dial in black Grand Feu enamel with an applied satin-finish ring, 18-carat red gold star appliques, and 22-carat gold moon crowning a black onyx moon disk. 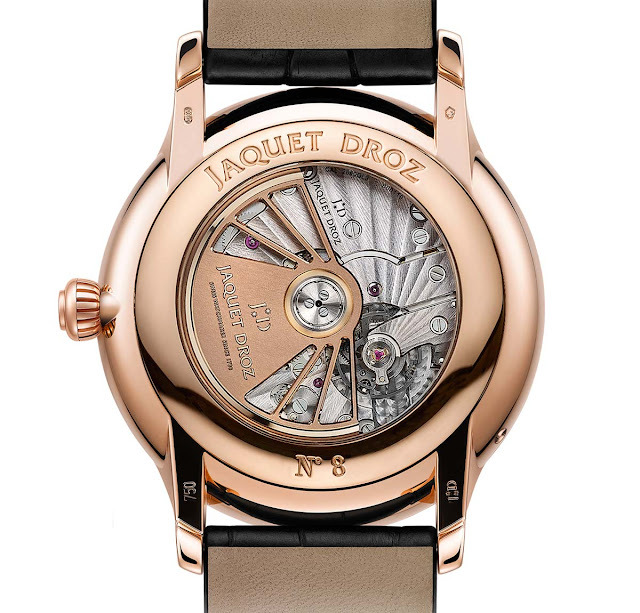 Beautifully framing the dial, the 43 mm red gold case houses a not less precious component, the movement. The self-winding Jaquet Droz 2660QL3 Calibre is equipped with balance spring and pallet horns made of friction-resistant and corrosion-resistant silicon for enhanced precision and reliability. 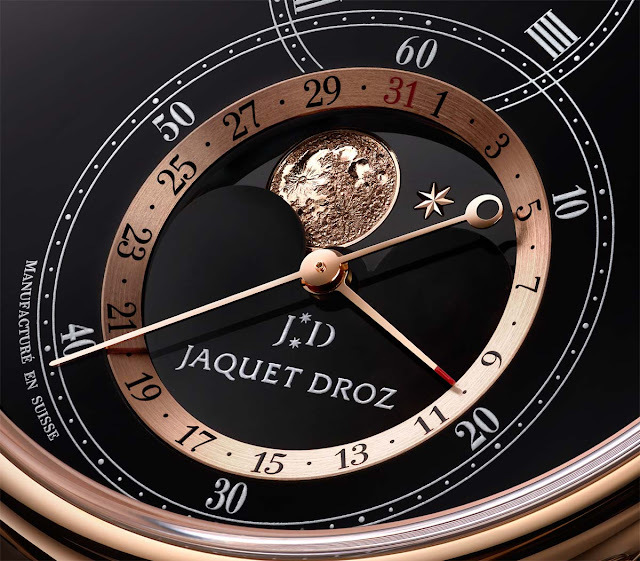 Beating at 28,800 vibrations per hour, the movement and its 8-karat red gold oscillating weight are visible through the sapphire crystal case back around which the individual serial number of each timepiece is engraved. The double barrel offers a power reserve of 68 hours or nearly three days. The astronomical moon phase implemented by Jaquet Droz requires adjustment only once every 122 years and 46 days. Thanks to its carefully studied gear ratio, the specially developed "mechanism 135" is much more precise than a traditional 59-tooth model, which accumulates an error of one day in approximately two years, 7 months and 20 days. 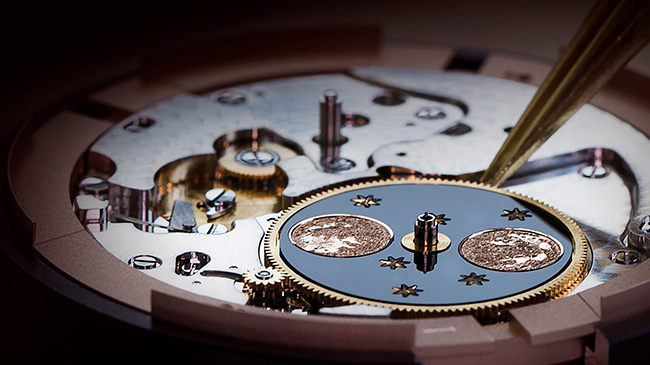 A corrector positioned at 8 o’clock enables the owner to set and adjust the moon phase with a simple push of the stylus that accompanies the timepiece. Elegant timepiece. I would like to see a wristshot. Hi Treasure_65, make sure to follow our Instagram channel for daily wristshots!